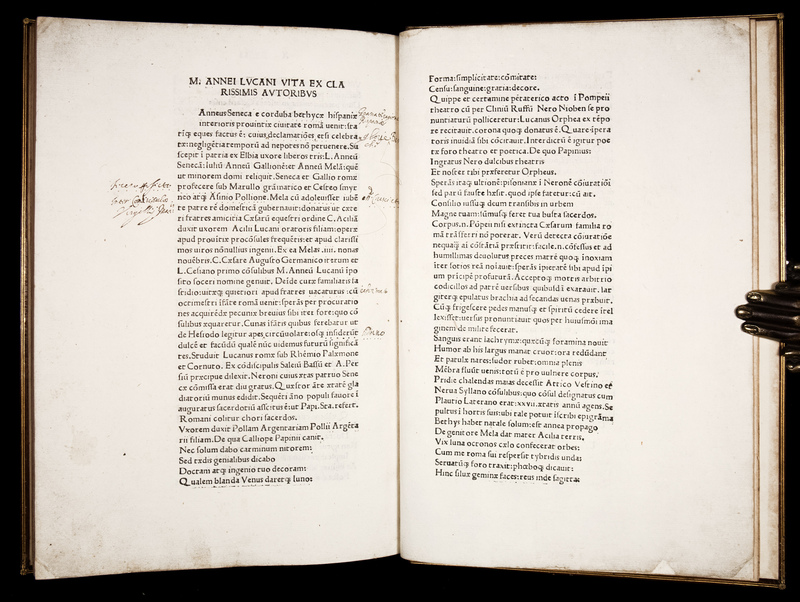 Parma: Deiphoebus de Oliveriis, 22 May 1483. 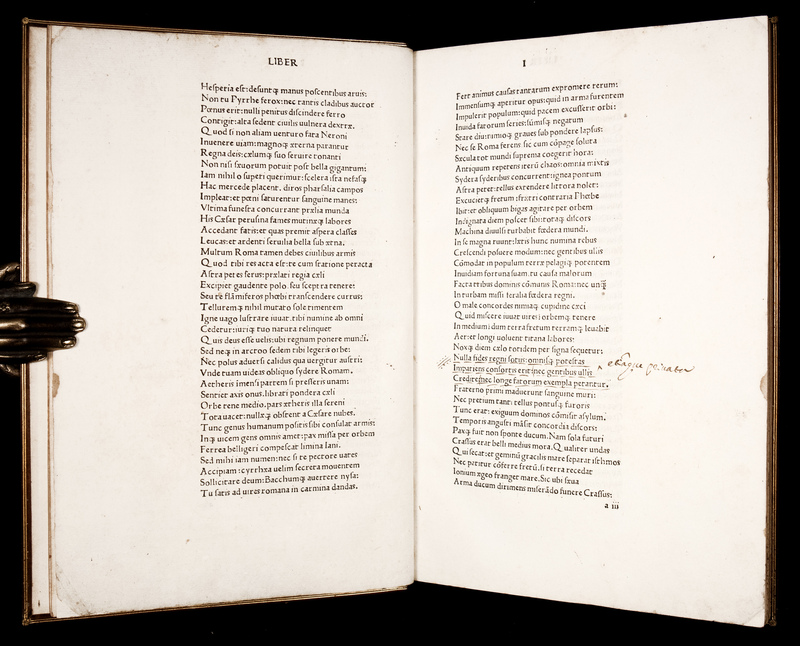 An excellent copy of this VERY RARE early incunable edition of LUCAN’S CLASSIC EPIC POEM, telling of the Civil War between Julius Caesar and the forces of the Roman Senate led by Pompey the Great. 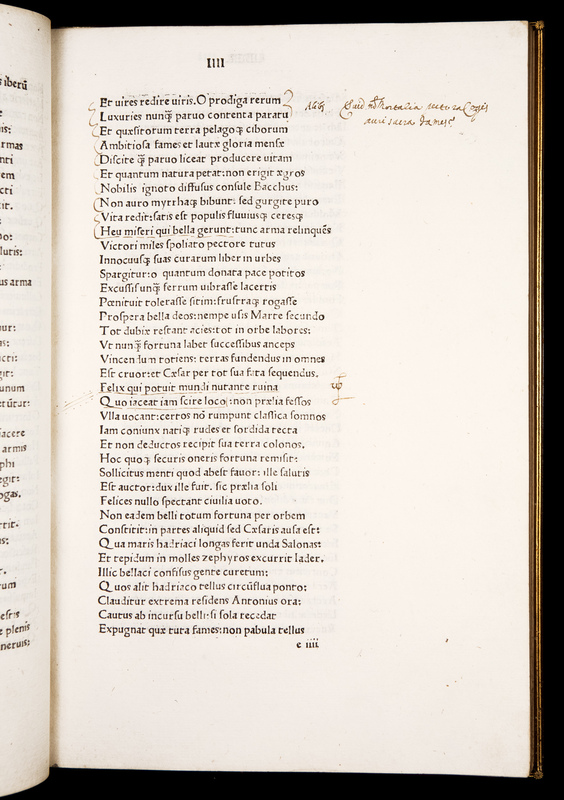 This fine folio edition, “apparently reprinted from the edition of De Lavagnia, Milan, 1477" (BMC), was produced at a very uncommon Parma press: Deiphoebus de Oliveriis is known to have printed only 3 books (including this one). No other copies of this edition sold at auction are traced in ABPC, and BL ISTC locates 27 copies worldwide (only 3 of them in the US). Ireneo Affò in his Scrittori e letterati Parmigiani (III, no. 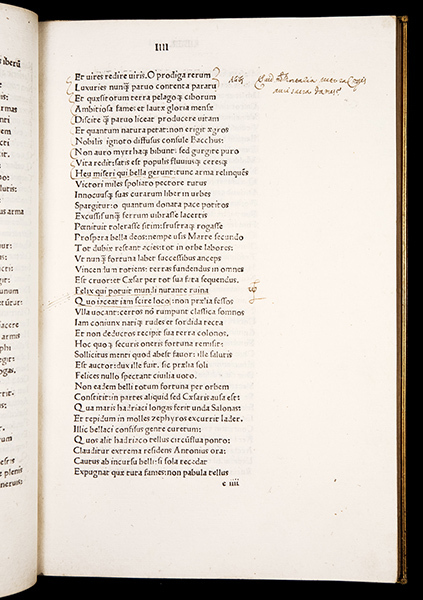 XXXII) calls this edition rare and elegant, noting its beautiful roman type and printed on fine paper with wide margins (“rara [e] assai elegante pel bel carattere romano, per la buona carta, e il gran margine”). Also included in this edition is Life of Lucan () by Julius Pomponius Laetus (1428 - 1498), an eminent Italian humanist. 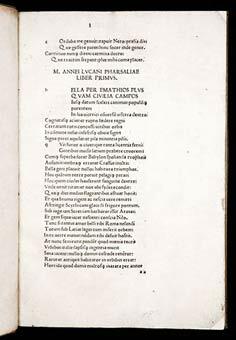 Marcus Annaeus Lucanus (39 - 65 AD), better known in English as Lucan, was a classical Roman poet, born in Corduba (modern-day Córdoba, Spain), in the Roman province of Hispania Baetica in the Iberian Peninsula. Despite his short life, he is regarded as one of the outstanding figures of the Imperial Latin period. 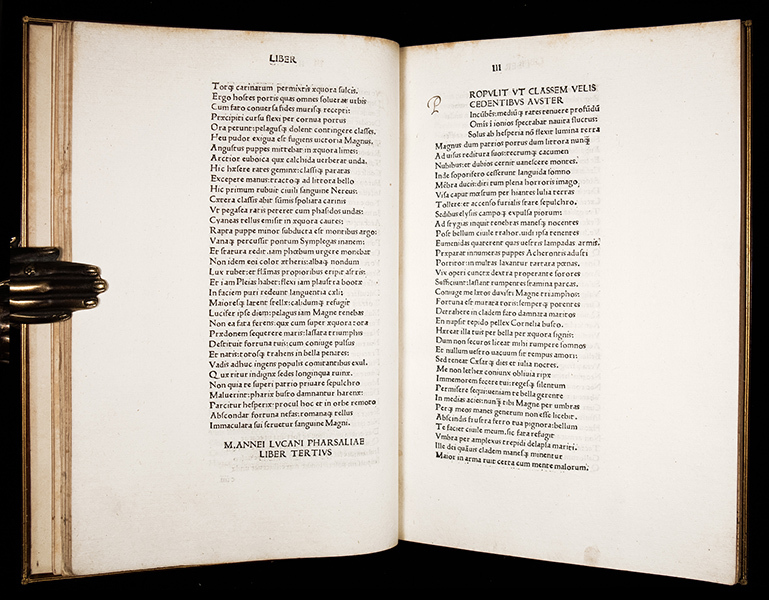 Lucan was the grandson of Seneca the Elder, and grew up under the tutelage of his uncle Seneca the Younger. Born into a wealthy family, he studied rhetoric at Athens and was probably provided with a philosophical and Stoic education by his uncle. He found success under Nero, became one of the emperor's close friends and was rewarded with a quaestorship before the legal age. In 60 AD, he won a prize for extemporizing Orpheus and Laudes Neronis at the quinquennial Neronia, and was again rewarded when the emperor appointed him to the augurate. During this time he circulated the first three books of his epic poem, Pharsalia on the civil war between Julius Caesar and Pompey. At some point, a feud began between Nero and Lucan. According to Suetonius, Nero lost interest in Lucan and Lucan responded by writing insulting poems about Nero that Nero continued to ignore. Other works, though, point to a more serious basis to the feud. 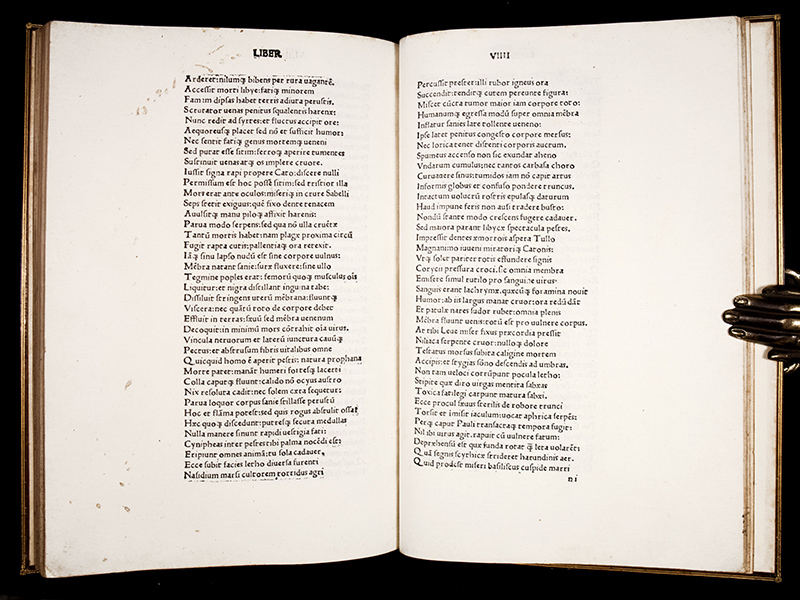 Works by the grammarian Vacca and the poet Statius may support the claim that Lucan wrote insulting poems about Nero. 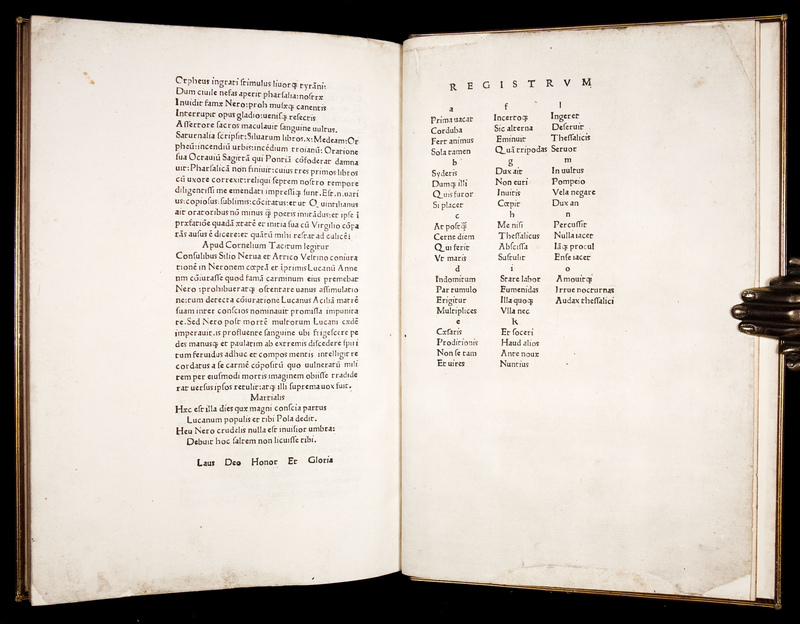 Additionally, the later books of Pharsalia are anti-Imperial and pro-Republic. This criticism of Nero and office of the Emperor may have been the true cause of the ban. Lucan later joined the 65 AD conspiracy of Gaius Calpurnius Piso against Nero. His treason discovered, he was obliged, at the age of 25, to commit suicide by opening a vein. The Pharsalia, also known as De Bello Civili ("On the Civil War"), is an epic recounting the civil war between Julius Caesar and the forces of the Roman Senate led by Pompey the Great. The poem's title is a reference to the Battle of Pharsalus, which occurred in 48 BC, near Pharsalus, Thessaly, in northern Greece. Caesar decisively defeated Pompey in this battle, which occupies all of the epic's 7th book. 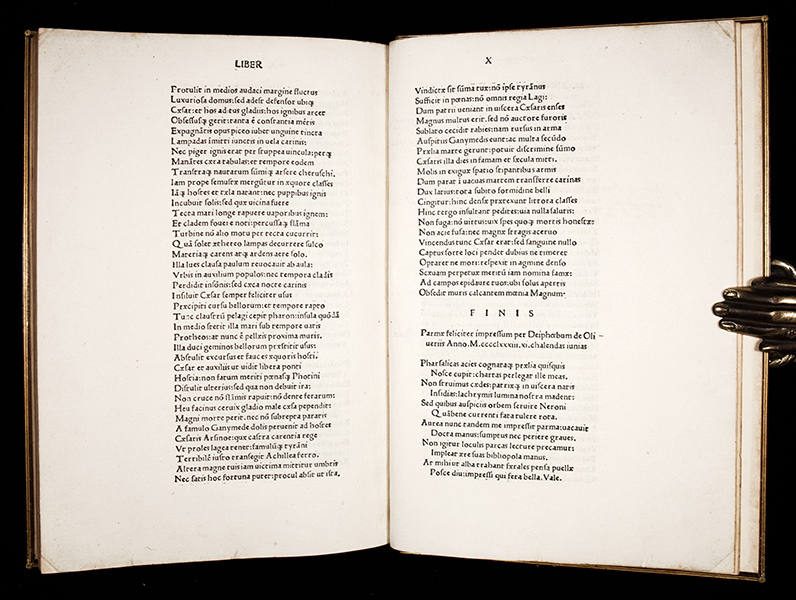 The poem was begun around 61 AD and several books were in circulation before the Emperor Nero and Lucan had a bitter falling out. 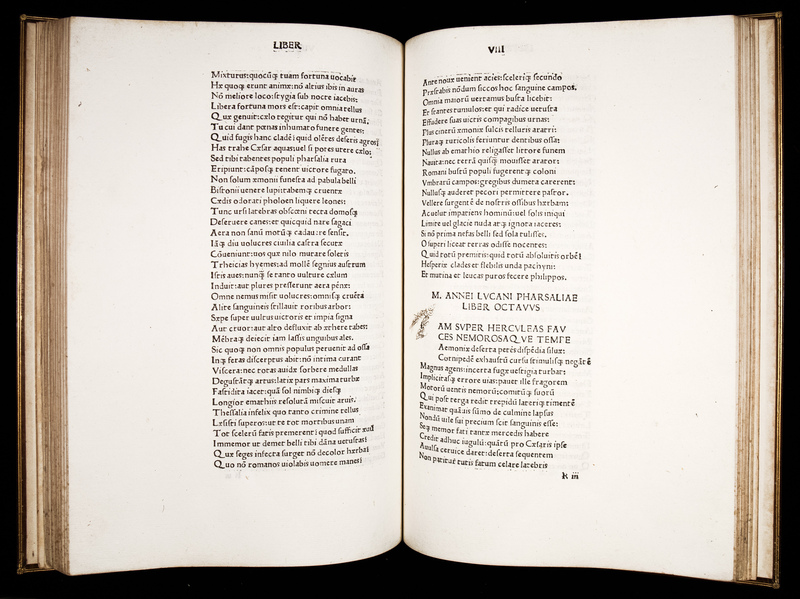 Lucan continued to work on the epic - despite Nero's prohibition against any publication of Lucan's poetry - but it was left unfinished when Lucan was compelled to suicide for taking part in the Pisonian conspiracy in 65 AD. 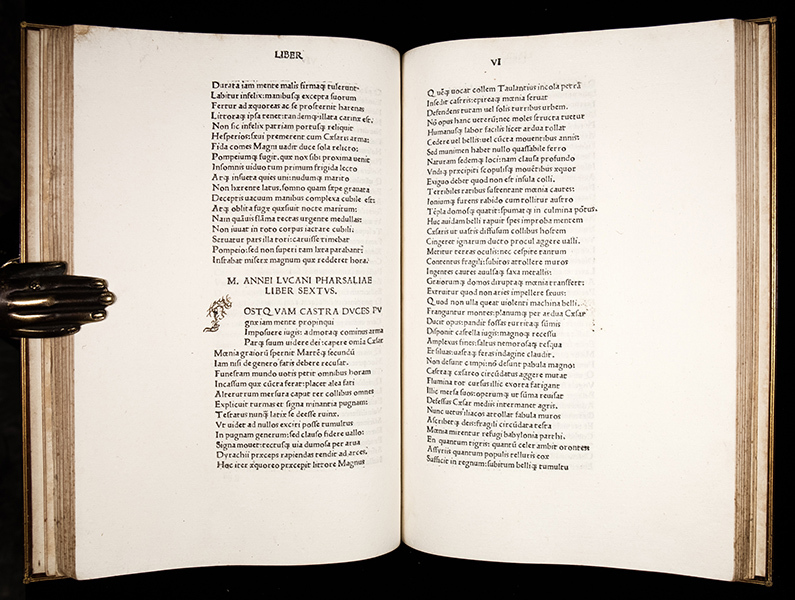 A total of ten books were written and all survive; the tenth book breaks off abruptly with Caesar in Egypt. 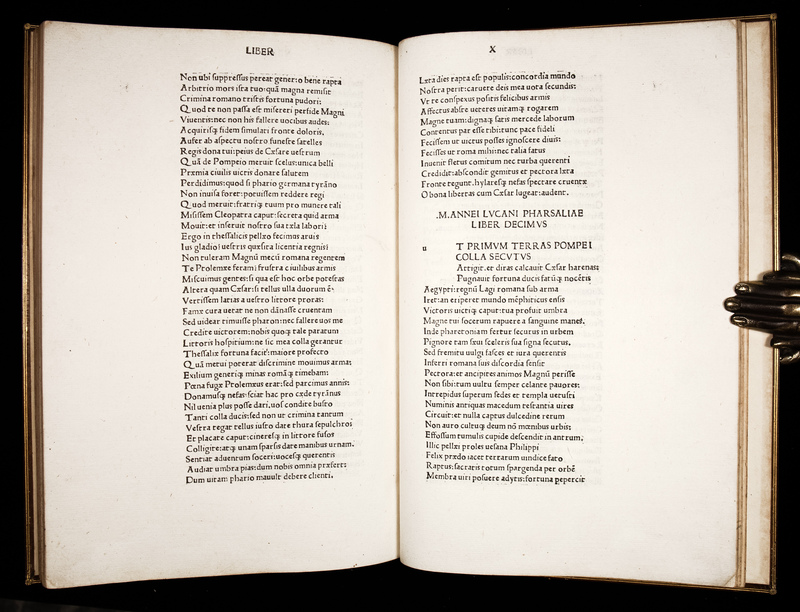 Though the Pharsalia is an historical epic, Lucan is more concerned with the significance of events rather than the events themselves. The civil war throughout the poem is described in terms of insanity and sacrilege. Most of the main characters are terribly flawed and unattractive; Caesar is cruel and vindictive, while Pompey is ineffective and uninspiring. Far from glorious, the battle scenes are portraits of bloody horror, where nature is ravaged to build terrible siege engines and wild animals tear mercilessly at the flesh of the dead (perhaps reflecting the taste of an audience accustomed to the bloodlust of gladiatorial games). The grand exception to this generally bleak picture is the figure of Cato, who stands as a Stoic ideal in the face of a world gone mad (he alone, for example, refuses to consult oracles to know the future). 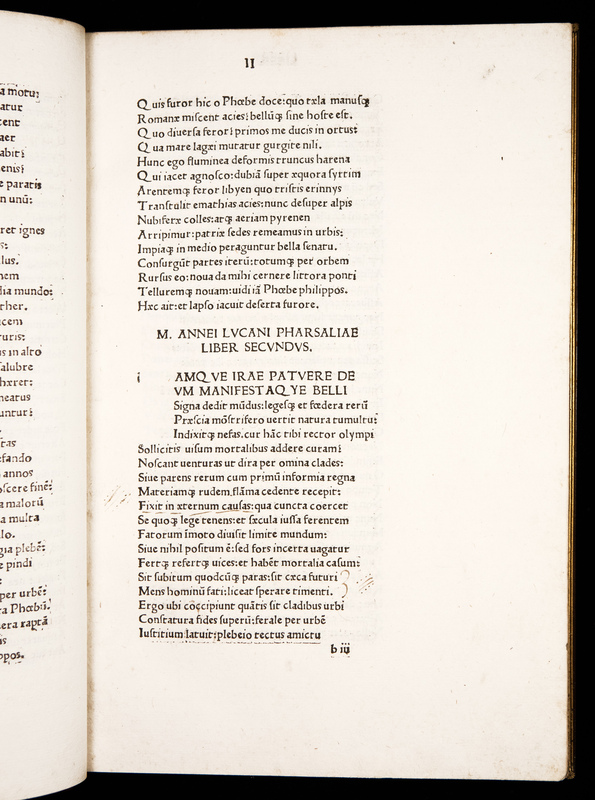 Pompey also seems transformed after Pharsalus, becoming a kind of stoic martyr; calm in the face of certain death upon arrival in Egypt, he receives virtual canonization from Lucan at the start of Book IX. This elevation of Stoic and Republican principles is in sharp contrast to the ambitious and imperial Caesar, who becomes an even greater monster after the decisive battle. Even though Caesar wins in the end, Lucan makes his sentiments known in the famous line 'Victrix causa deis placuit sed Victa Catoni' (i.e. "the winning cause pleased the gods, but the losing cause pleased Cato"). This line has been a favorite with supporters of 'lost' causes over the centuries. One American example comes from the Confederate Memorial at Arlington National Cemetery, which has these words inscribed on its base. Pharsalia was popular in Lucan's time and remained a school text in late antiquity and during the Middle Ages. Dante includes Lucan among other classical poets in the first circle of the Inferno, and draws on the Pharsalia in the scene with Antaeus (a giant depicted in a story from Lucan's book IV). 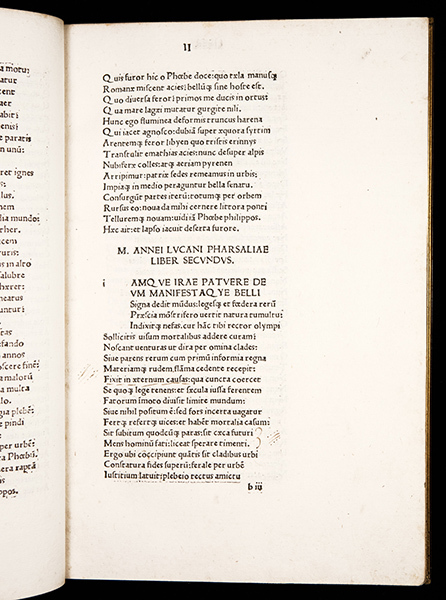 Christopher Marlowe published an English translation of Book I, and Thomas May followed with a complete translation in heroic couplets (1626). Folio; text block measures 288 mm x 192 mm; wide margins. 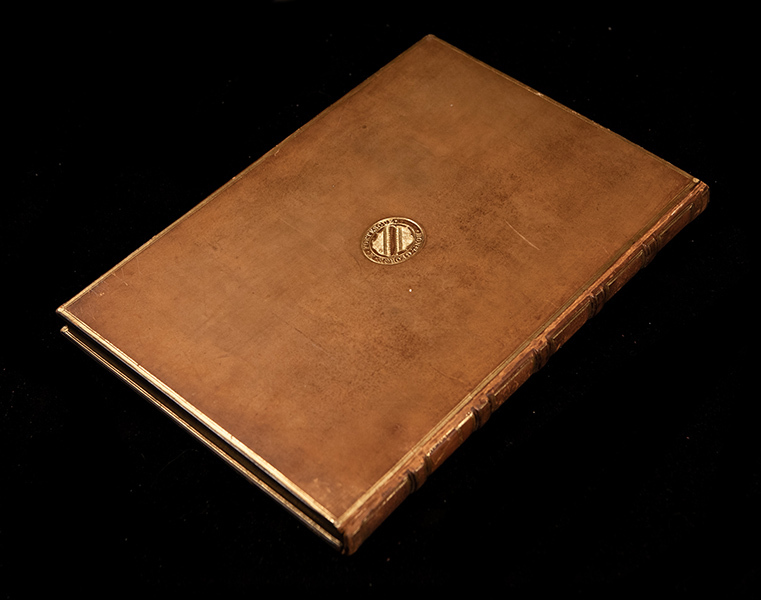 Bound in full early 19th-century calf gilt, front cover with gilt armorial supralibros, both covers framed with gilt-ruled fillet borders; turn-ins also with double-ruled gilt fillet borders. Spine with five broad raised bands; ruled and lettered in gilt. All edges gilt. 109 unnumbered leaves (forming 218 pages). Signatures: a–n8 o6 [-a1 blank]. Collated and COMPLETE (without the front blank). 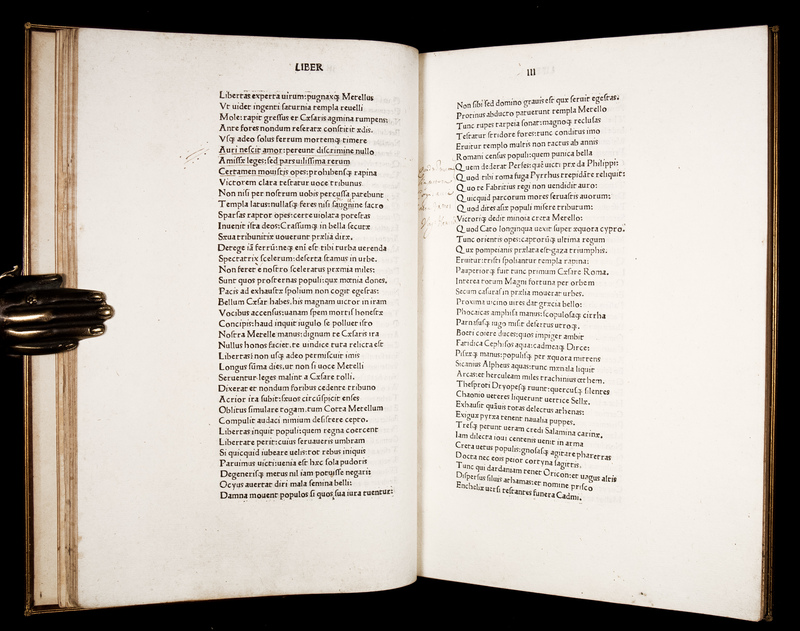 Printed in Roman type, in single columns, 38 lines per page (plus running head). 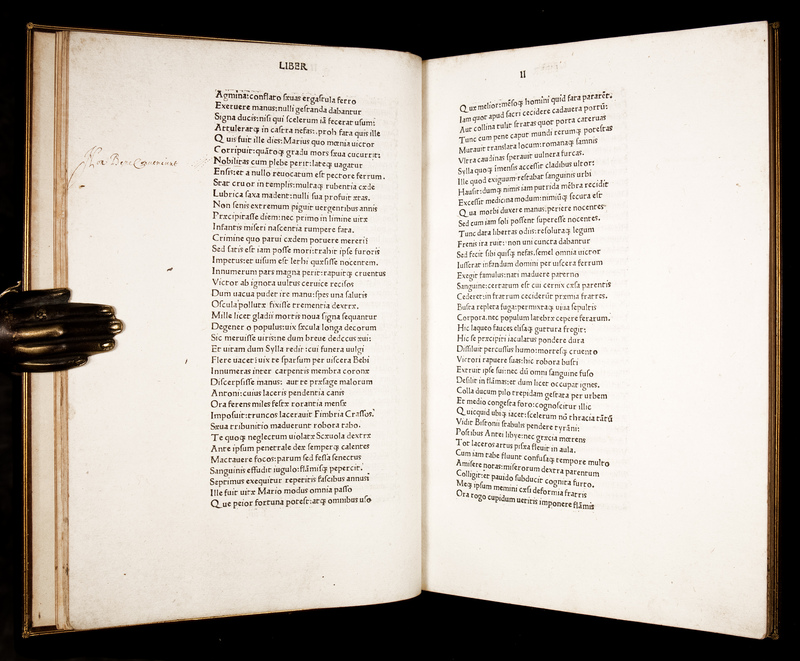 Capital spaces with guide-letters (unrubricated). Text begins on a2r with an epitaph of Lucan in two elegiac distichs (Incipit: 'Corduba me genuit, rapuit Nero...'). Colophon, followed by verse.in six elegiac distichs (Incipit: 'Pharsalicas acies cognataque...') on leaf o4r; Life of Lucan by Laetus 'M. 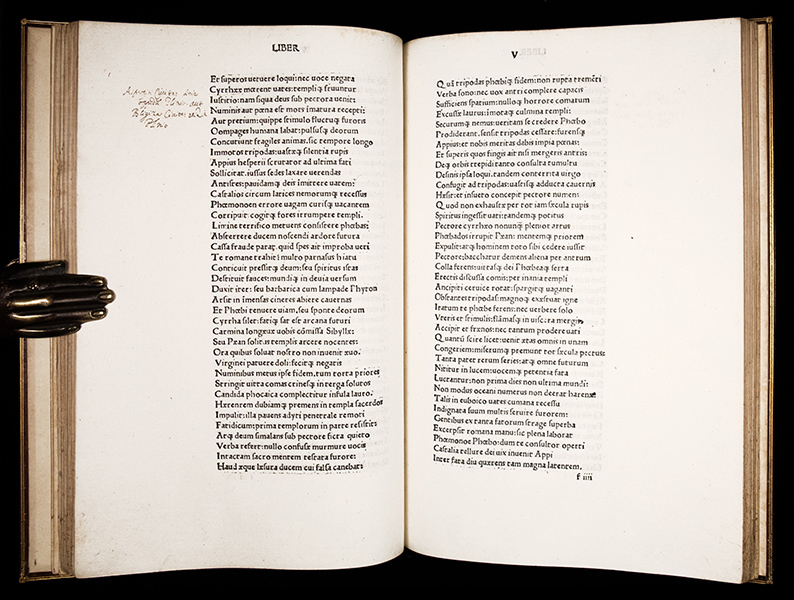 Annei Lucani vita ex clarissimis autoribus' (Incipit: '[M] Anneus Seneca e Corduba Bethycae Hispaniae interioris..') followed by Martial's Epigram VII:21 on leaves o4v-o5v; Registrum on o6r (verso blank). Armorial supralibros of Captain Hon. George Matthew Fortescue (1791-1877) of Boconnoc and Dropmore, on front cover. Very Good antiquarian condition. Complete. 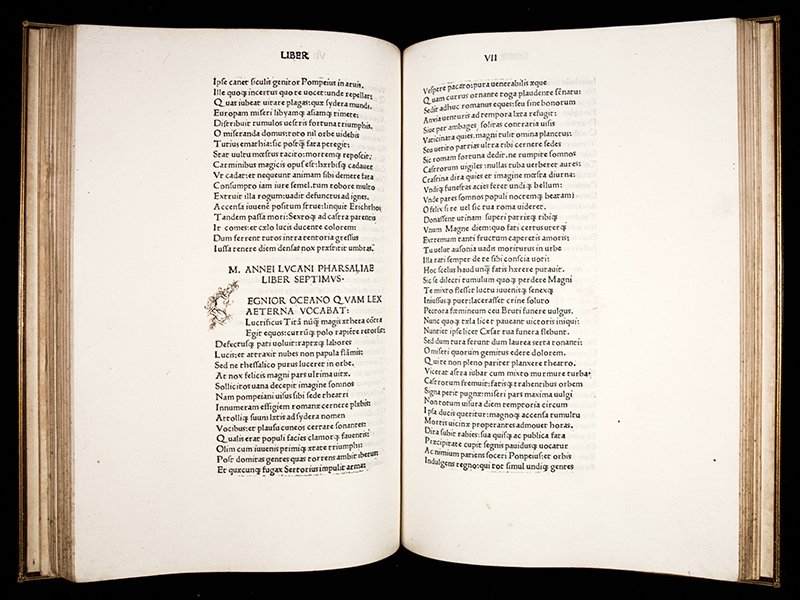 A few leaves at the beginning and the end of volume with very minor and discrete marginal repairs to tips of fore-corners of opening 4 and final 15 leaves neatly repaired, final leaf o6 (register, blank verso) with neat marginal repairs (text not affected). Several leaves with minor manuscript marginalia in an early hand, and a few early underlinings; a few capitals supplied in brown ink in an early hand. Occasional light soiling, a little more noticeable on the first and last leaf. Binding slightly rubbed, with light wear to joints; binding tight, with leather fresh and supple. In all, a very attractive, clean, wide-margined example of this rare, finely printed incunable. Goff L300; Reichling (App. to Hain-Copinger) 10236; Bod-inc L-157; Proctor 6862; BMC VII 943; GW M18848; Polain(B) 2514bis; IGI 5817; Oates 2578; Rhodes(Oxford Colleges) 1107; Affò, Scrittori e letterati Parmigiani III, no. XXXII.